From Yakutia in Eastern Siberia, land of tundra, taiga and diamonds, Ayarkhaan's voices and Jew's harps appeal directly to spirits of nature and to listener's soul. The founder of the group Albina Degtyareva is born in the little village of Kyrgyday, Republic of Sakha, in Eastern Siberia, Russia and now is living in Yakutsk, the capital of the Republic, that is also formerly known as Yakutia. Currently she works as a khomus (Jew's Harp) music teacher at Yakutsk Music College and as the artist of Yakutia's State Variety Art Theater. Graduated from Yakutsk State University with major in the Sakha language and literature. Since 1991 she performs on stage as a professional artist. Well-known outside of the Sakha Republic and Russia. Considered as the promoter of khomus music. Her Jew's-harp playing is notable for gifted creativity, individual style, subtle technique, and strong improvisation. Her well-known compositions are At a Tethering Post, Lullaby, The World of Nature, Home Tunes, etc. She rediscovered and brought back to the listeners some of the oldest singing styles pof the Skaha people – nasal, throat, palatal singing. Those techniques are effectively used in Albina's music and theatrical performance. Being a khomus master-player, Albina Degtyareva deserved the right to be the honored representative of the Republic of Sakha (Yakutia) when it concerns the expression of her people's soul. She regularly participates in many official events arranged by Yakutia's Government within Russia and abroad. She took part in Days of the Republic in Moscow, St.Petersburg, Khabarovsk, China, Japan (EXPO 2005), and other places. Albina Degtyareva made music for a number of film and TV productions. For instance, the movies “The Echo of Centuries” (1984), “The Yakut Ballad” (2000), “Congeners” (2001). She appears on various CDs, released in Russia, Austria and Japan. She is also known as a skillful clothes designer for her stage shows. 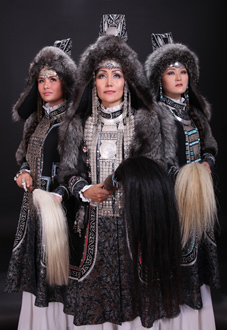 Her costumes done in traditional style earned the Grand-Prix of Yakutia fashion competition “Saharha” in 1997. She is a poetess as well. Her works have been published in printed media. Albina also has made research work for International Khomus Center (known also as Yakutsk Khomus Museum). To promote the living Yakut ethnic music and singing, Albina Degtyareva established a group “Ayarkhaan” in 2002. This group performs many Jew's Harp based pieces, created and arranged by Albina, revives various lost manners of singing – khabarha yryata, tanalai yryata, etc. The concert program is based on inherent symbols of the shamanistic Sakha mythology: Creation of the World, Patron of Horses, sacral Birch Tree, blacksmiths' profession etc. Albina Degtyareva and Ayarkhaan's stage performance and their self-developed costumes always create a furor and accept the warmest welcomes. One wouldn't expect such an impact from a few tiny ladies playing one of the world's smallest instruments. When in November 2009 Albina performed solo in Amsterdam in the Milky Way Club at Balkan Revolutia festival, the usually loud Dutch audience stood still holding breath from the very first to the very last note she played, only to explode in loudest applause of appreciation. In 2011 Albina received a special governmental prize "The Soul Of Russia". Watch here highlights of the Ayarkhaan's performance in the beautiful main concert hall of Danish Radio during Womex 2011.